At last they've released a DVD copy of one of Tim's lesser known movies. Well maybe movie is a little much, this is basically the 70 minute Central Television feature. Previously released on VHS in the UK, I know because the kids have worn our copy out over the years. 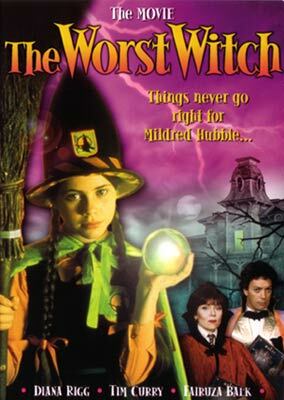 Based on the book by Jill Murphy "The Worst Witch" tells the story of Mildred Hubble, played by Fairuza Balk, who is the odd witch out at Miss Cackles Academy of Witchcraft. Will Mildred overcome her clumsiness and save the day? Guess! Trivia Time: Fairuza Balk later starred in "The Craft" where she again played a witch. The movie has inspired a modern day television series of The Worst Witch, but Tim only gets to appear in this original version, despite what some web sites listings may say. Tim Curry plays the Grand Wizard and gets to sing (a song about Halloween) as well. What you have to remember is this television movie was made in 1986, so don't expect Harry Potter special effects. Tim's big number in particular shows off the state of the art video techniques of twenty years ago, you can see the fringing around the blue/green screen effect quite badly. Hopefully a region 2 version will appear soon, until then you may order a copy from the USA and as long as you have a multi-region DVD player you should be fine. The disc is a fair transfer, the original nature of the production as being on video-tape is apparent, but this is a good as it gets. Extras include "Elements of Witch Potions & Spells", "Cast Trivia" and "Cast Profiles". For the last time! "Scene Selection" is not a Special Feature despite what some DVD authoring houses think. Nice animated menus by the way. For once Tim's autobiography correctly lists him as first starring in "The Rocky Horror Show", I've lost track of how many times "The Rocky Horror Picture Show" is substituted for "The Rocky Horror Show" in articles. Nice to see someone on the ball there.